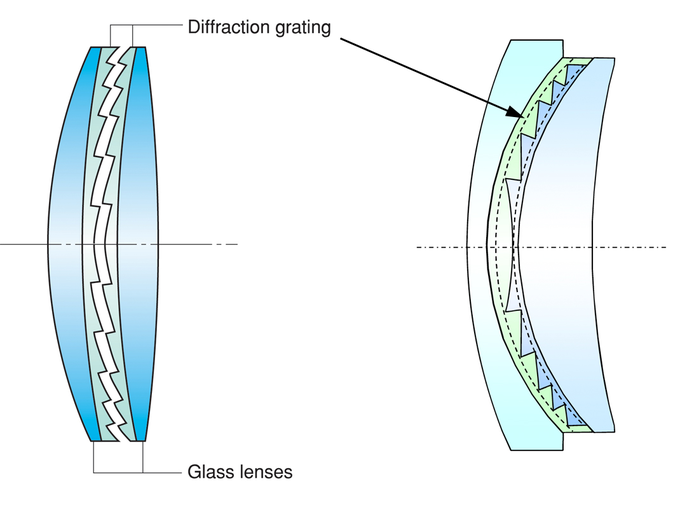 The majority of optical instruments for photography make use of two basic physics laws: refraction and reflection. Instruments with mirrors are not so popular but you can find them among astrophotography equipment or in catadioptric lenses which feature both refractive and reflective elements. 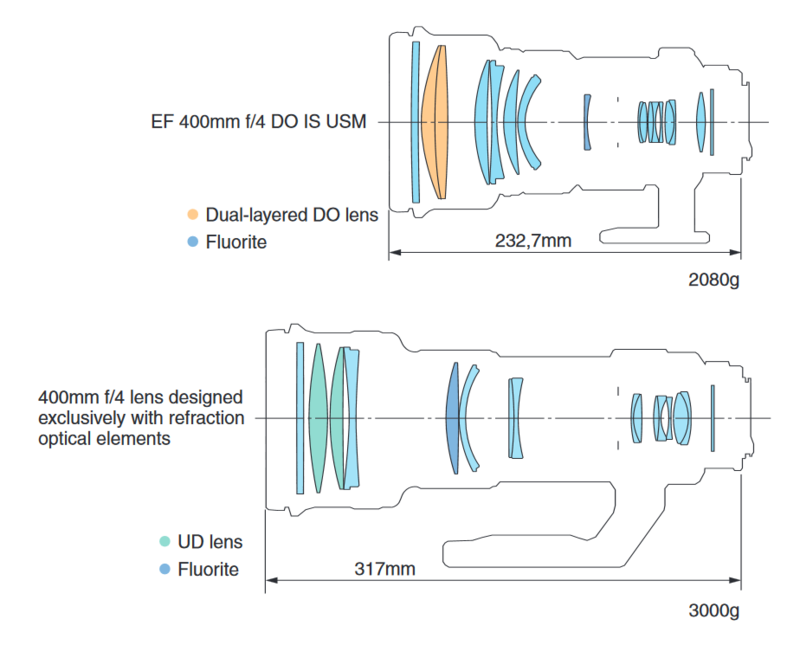 That situation changed in 2001 when Canon launched a lens which is based on diffractive optics. 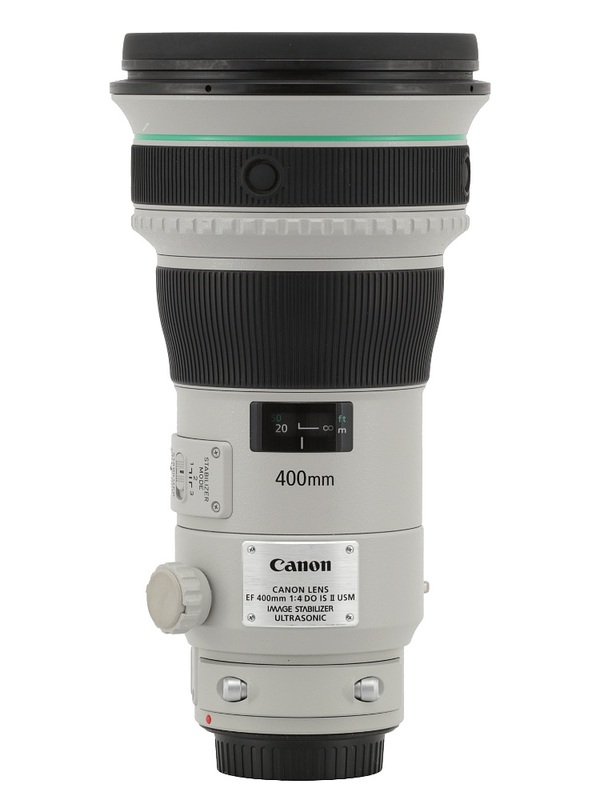 We think about the EF 400 mm f/4L DO IS USM, in which you got a DO element - a dual-layered glass parts divided by a diffraction lattice - instead of the first refractive element. A DO lens in reality consists of a glass spherical lens with a diffraction lattice on its surface which is made of special plastics. The thickness of the lattice amounts to just several micrometers and its period changes gradually from several millimetres to several dozen micrometers. In order to create a diffraction lattice its period, height and positioning has to be controlled to units smaller than a micrometer. Of course you can ask whether it is worth to introduce a new technology at all. Actually it has two major assets. The first: you can reduce physical weight of an instrument. An efficient, strong refraction of light often demands a thick lens made of exotic, expensive type of glass. Much lighter DO elements (but, unfortunately, equally expensive) can produce the same effect. 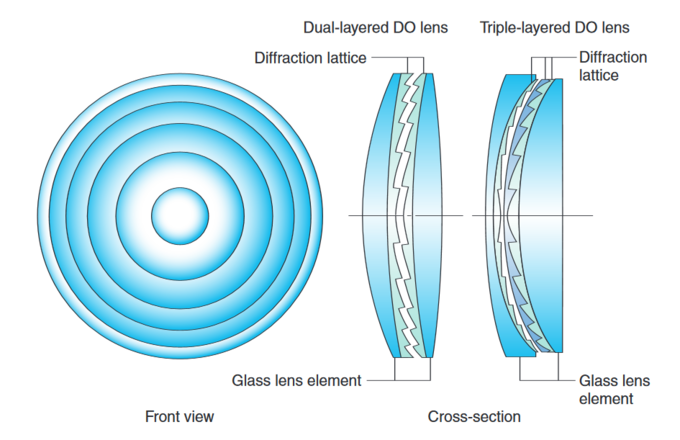 Below you can find a comparison between dimensions and weights of 4/400 class lenses produced using classic and DO technology. The second advantage concerns reversal of chromatic aberration. When a ray of light passes through normal glass it becomes dispersed - polychromatic beam is separated into its constituent wavelength components. The more energetic the light, the more intense its interaction with the glass. As a result purple-blue colour is focused nearer the lens and red light is positioned in further distance. After using the DO system the dispersion order is reversed. 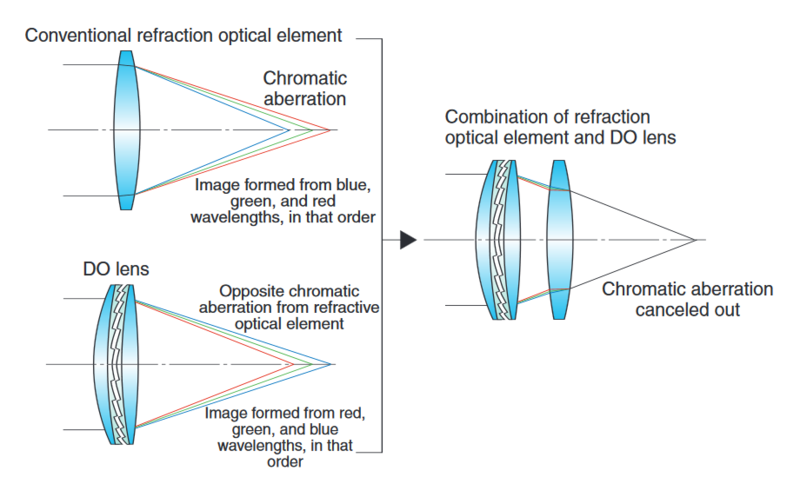 As a result, if you join a DO system and an ordinary lens you get a much lower level of chromatic aberration than in case of each of these elements but examined separately. The first DO photographic lens had that system positioned instead of a front element. 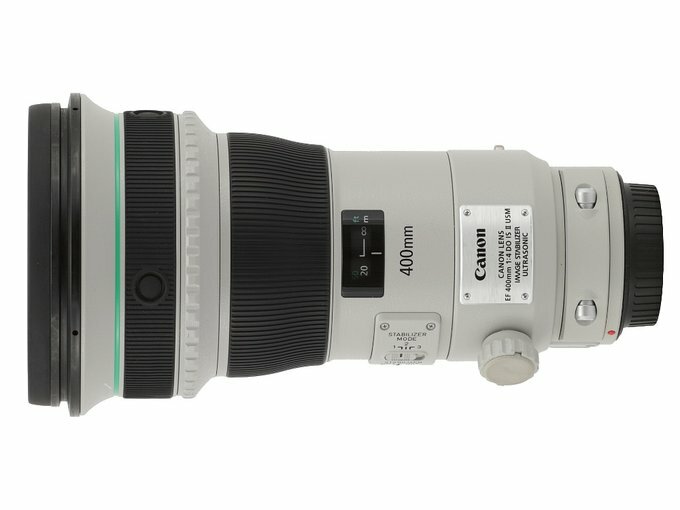 That situation changed in 2014 when Canon presented a new generation of devices in a form of the EF 400 mm f/4 DO IS II USM. Now the first element is made of ordinary glass. Then goes a dual-layered element consisting of two parts: a low-dispersion UD glass component and an aspherical element which are glued together. Only then the beam of light falls into a DO system which, contrary to its predecessor, is gapless (see: picture below). No gap means the system is less sensitive to flares and contrast loss. 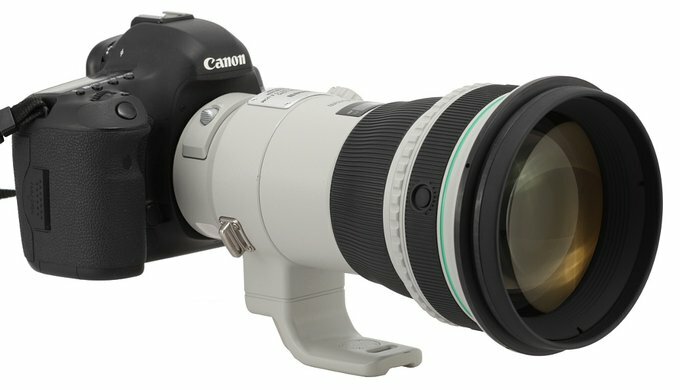 We could hardly wait to test such an interesting lens and check how the new DO technology and other novelties the lens had been stuffed with performed in practice. Finally the new Canon found its way to our editorial office and we can share our impressions in the following chapters – enjoy! 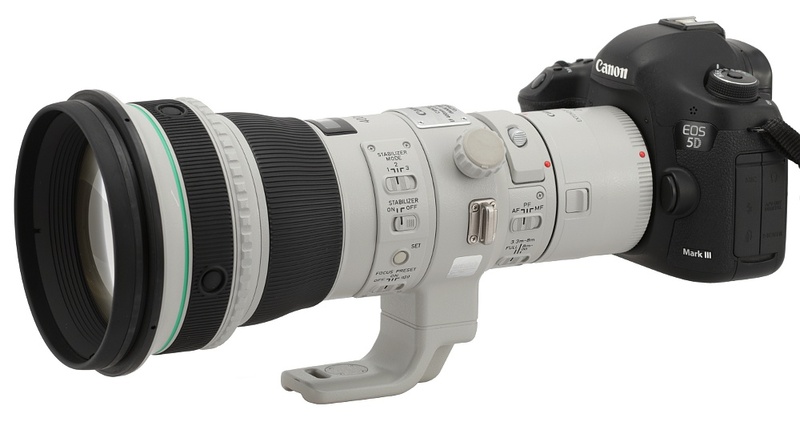 We would like to thank the Proclub rental company for making that lens available to us.